For those familiar with Kenneth F. Russell’s comprehensive exploration of the production history of the Catoptrum Microcosmicum, found in his 1991 publication, A Bibliography of Johann Remmelin, the Anatomist, you will know that my seemingly innocuous inclusion of the possessive “s” within this article’s title touches upon a particular nerve. 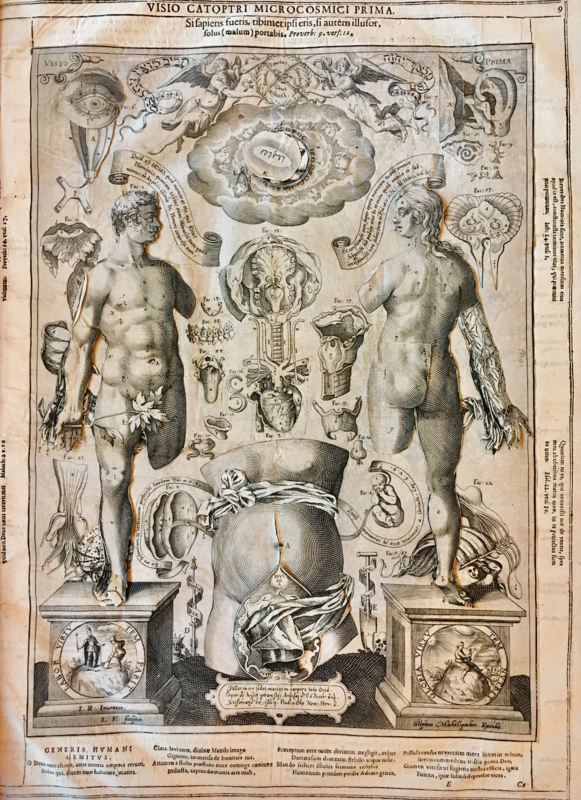 The magnificent prints of the Catoptrum Microcosmicum, the moveable engravings of which allow readers to explore the sinuous interiors of the human body, were first printed and distributed in 1613 in modern-day Germany. 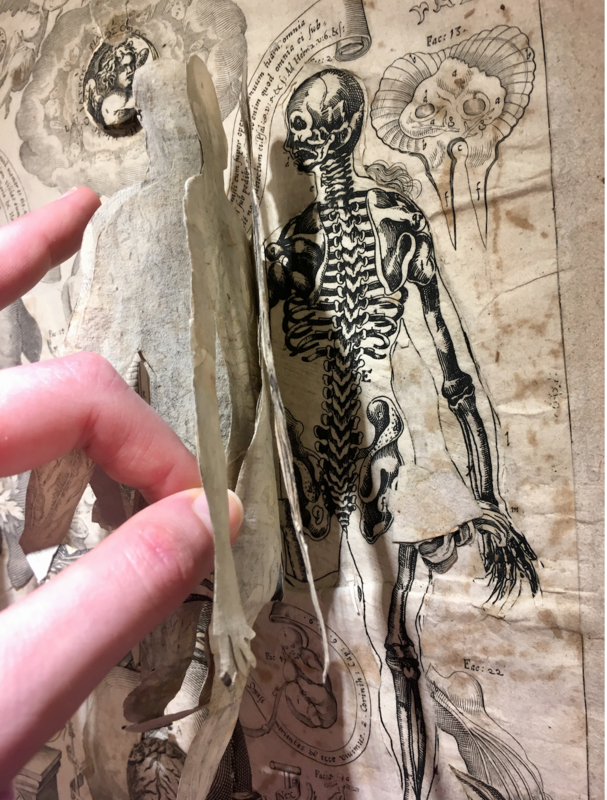 In stark contrast to subsequent editions of this anatomical flap work, the 1613 printing did not include any text, such as anatomical indices. Only a confusing set of initials and names appeared on the edition’s Visio Prima: “I.R. Inventor”, “L.K. Sculptor”, and the full name, “Stephan Michelspacher Excudit” (in printmaking, the title of “execudit” was typically affixed to the artist’s name). And while it was later inferred that “I.R.” refers to Johann Remmelin and “L.K.” to the engraver of the plates, Lucas Kilian, many of these early editions of the Catoptrum Microcosmicum are still catalogued such that its publisher, Michelspacher (or “Michael Spacher”), is credited as the author. Vexed questions about the nature of intellectual property within the realm of early modern bookmaking are brought to the fore by and encapsulated within this possessive “s”. Interestingly, though, this atmosphere of uncertainty surrounding the work’s author proved generative. That is to say, the confusion that ensued in this period between 1613 and 1619 (it was in 1619 that Remmelin produced what were supposedly the authorized versions of his plates, now with accompanying Latin text) has both left an indelible mark on (literally), and arguably made possible, the vivid geographic and linguistic journey traveled by this mechanically innovative paper product. As is noted by Russell and other scholars of the Catoptrum Microcosmicum, all subsequent editions of the work made use of either the 1613 or the modified (per Remmelin’s instructions) 1619 copper plates. The tantalizing ambiguity of the plates’ authorship aside, it is generally agreed that Remmelin designed the plates as early as 1605. At this time, a twenty-two-year-old Remmelin is cited by Russell as pursuing his doctoral studies in medicine at the University of Basel. The methods by which medicine and, by logical extension, human anatomy were taught in seventeenth-century Western Europe could not be divorced from the period’s prevailing ideological strictures. “Hands-on” dissection–the practice of which necessitated the procurement of cadavers–was only recently championed by Andreas Vesalius, author of the highly influential anatomic treatise, De humani corporis fabrica (1543), some sixty years prior. The air of potential blaspheme still wafted through the halls of Basel’s operating theaters as a young Remmelin prepared to become the future town physician of his native Ulm, located in the modern German state of Baden-Württemberg. These aforementioned ideological strictures in mind, certain questions remain debated among scholars of anatomical flap works, namely: For whom were these works produced? And what demographics or kinds of people composed Remmelin’s intended audience for the Catoptrum Microcosmicum? In his book, Russell argues that indeed Remmelin sought to create an effective instructional aid for medical students: “Remmelin’s plan would seem to have been to try to improve the anatomical detail by using the woodcuts of Vesalius and by increasing the number of flaps to provide plates which would give students a portable compendium of the anatomy of the body seen, as it were, in depth”. Though, before returning to these questions of audience, it should be noted that Remmelin was not the first person to undertake the mechanically tedious process of designing and producing anatomical flap works. 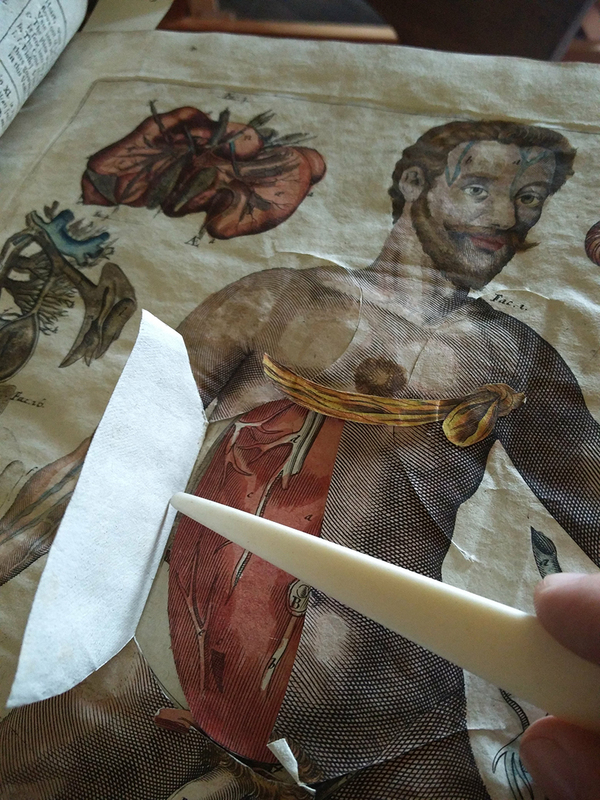 Broad or fugitive anatomical sheets with moveable parts began to circulate in modern-day Germany as early as 1538. Two men, Jobst de Negker of Augsburg and Heinrich Vogtherr, have been credited as pioneers of this genre of book or paper materiality. 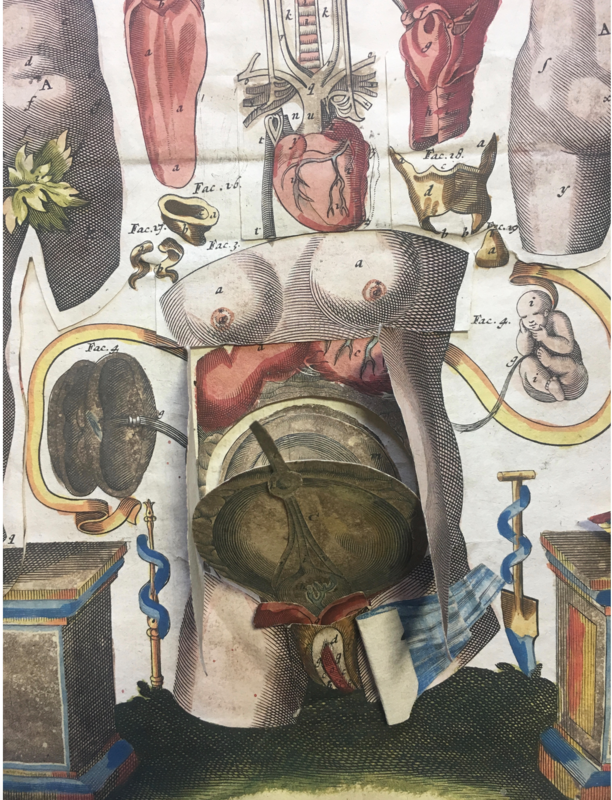 Notably, and with regard to these questions of audience, the language of choice for the accompanying text of these early anatomical flap works was vernacular German. This has led some scholars, such as L.H. Wells, to speculate that, in fact, these innovative paper products were produced for public consumption. They were intended as curiosities. Further complicating questions of audience is the accuracy of the anatomy depicted in these anatomical flap works. As has been noted by numerous scholars of Remmelin, the anatomy depicted in the first edition of the Catoptrum Microcosmicum was already considered outdated or incorrect at its time of publication in 1613. Whether intended by Remmelin (or by Stephan Michelspacher, all things considered) to serve as instructional aid or public curiosity, and despite the technical expertise required to craft a single copy of the work (eight plates in total, five of which were devoted to a myriad of delicate engravings that had to be individually cut and pasted to form the flaps), the enduring popularity of the Catoptrum Microcosmicum cannot be refuted. Numerous editions, reimaginings, and reworkings emerged throughout Europe and further afield until the mid-eighteenth-century. The work seemed to profit from the initial authorial ambiguity which surrounded it; no precedent was established for deference; and the paper cadavers of the Catoptrum Microcosmicum gained (multiple) life (lives) through appropriation, adaptation, and domestication. For example, it is even thought that Remmelin’s plates found their way to Japan via Dutch trade–the male and female figures of the Visio Secunda and the Visio Tertia respectively were re-envisioned as Japanese in phenotype. Naturally, the work’s geographic dissemination gave way to and also necessitated a dynamic legacy of translation, with accompanying text appearing in at least five languages: Latin, German, French, Dutch, and English (some scholars, including Cali Buckley, argue for the inclusion of Italian among this list). Interestingly, Russell notes in his book that Remmelin’s sons were the first to undertake the task of translating the anatomical flap work into vernacular German, perhaps solidifying the work’s public appeal. Buckley, Cali. “Johann Remmelin’s Catoptrum Microcosmicum and the End of an Era.” Bodleian Library Record, vol. 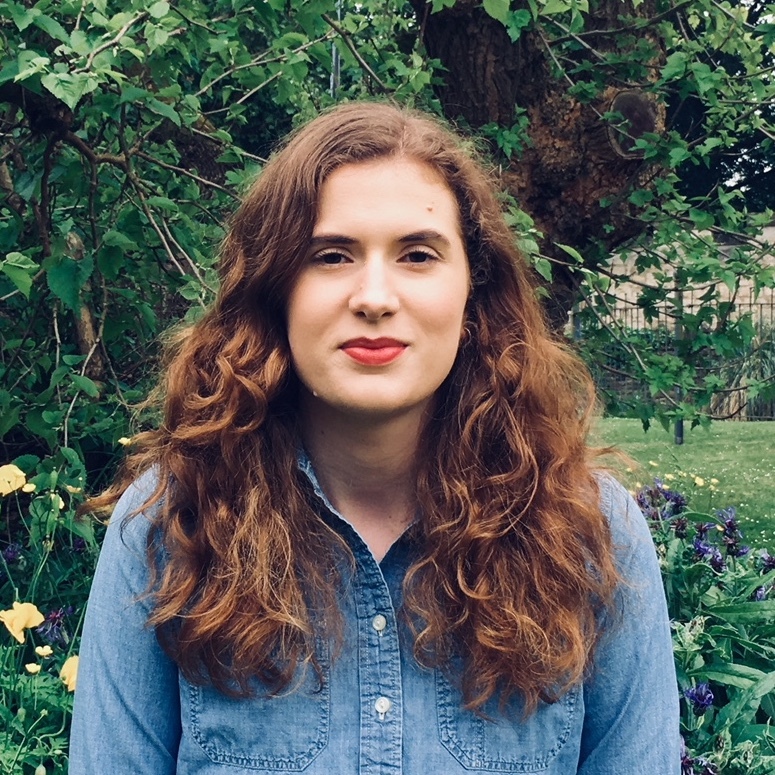 26, Apr. 2013, pp. 18–35. Carlino, Andrea. 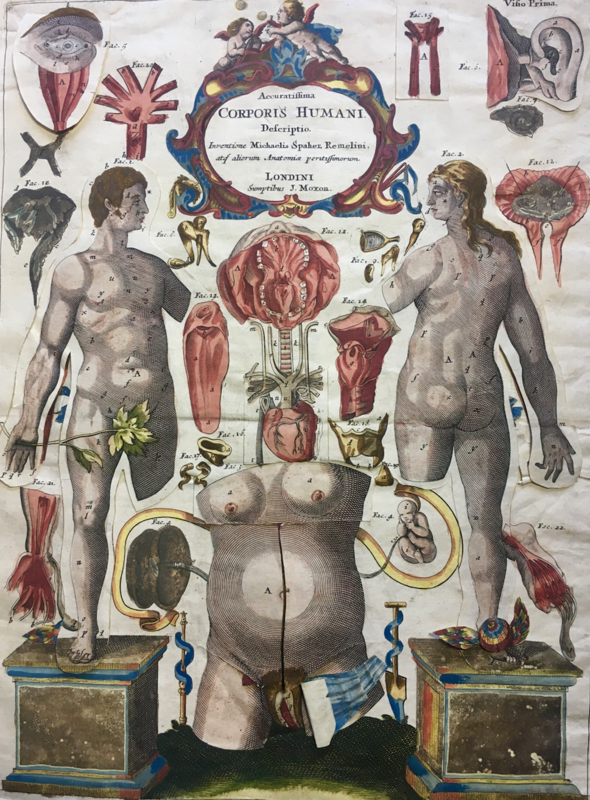 Paper Bodies: a Catalogue of Anatomical Fugitive Sheets 1583-1687. Wellcome Institute for the History of Medicine, 1999. McCall, Timothy, et al., editors. Visual Cultures of Secrecy in Early Modern Europe. Truman State University Press, 2013. Roberts, K.B., and J.D.W. Tomlinson. 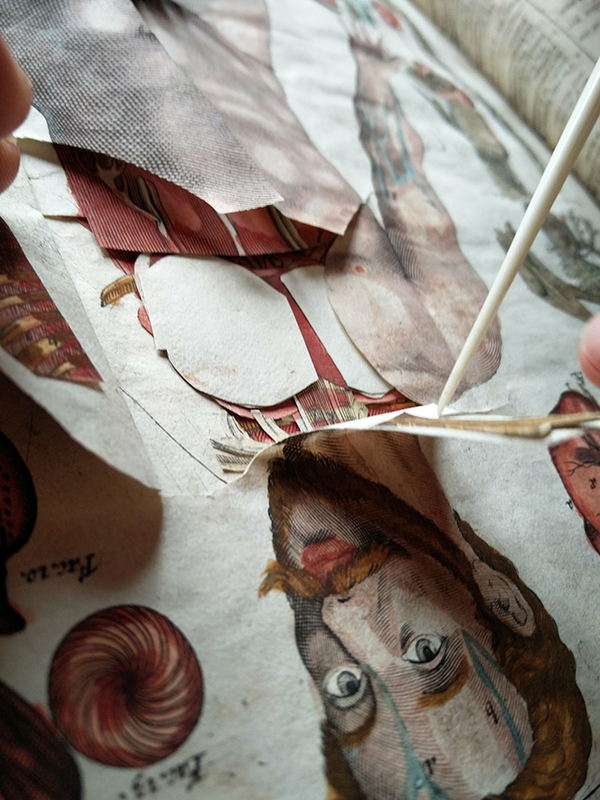 The Fabric of the Body: European Traditions of Anatomical Illustration. Clarendon, 1992. Russell, Kenneth F. A Bibliography of Johann Remmelin, the Anatomist. J.F. Russell, 1991.